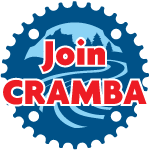 This is a safety net for us just in case, on the off-chance, IMBA dissolves their chapter program we (CRAMBA) keep our own assets. Marty said she is in contact with Armadillo for CRAMBA T-shirts. Mike reported that we have approval from all parks with written approval/permission from Ruby Campground and Bloomer expected soon. Marty proffered that trail day volunteers may be the key to getting volunteers to be more active in chapter business. The term “Trail Mom”, or a coordinator to talk to, get names, barbecue, etc. to deliver on this idea. Next board meeting will be June 15, Thursday, at 7:00 PM at the Fitzpatrick Irish Pub.